Home > Law Books > Practice Materials > O'Connor's Texas Civil Appeals, 2019 ed. 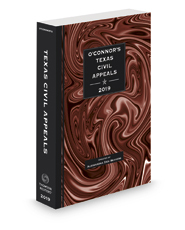 O'Connor's Texas Civil Appeals is the complete appellate-practitioner resource, including a plain-English guide to appellate practice, over 400 easy-to-use forms, annotated rules of appellate procedure, and timetables for the appeal. It saves practitioners time and money by combining the rules, expert advice, forms, and court information in one volume. O'Connor's Texas Civil Appeals is the only comprehensive yet portable appellate practice guide for Texas.